Click here to view the official race times for the 2016 Ad Astra Running MASS STREET MILE. These results will be broken down by gender and age group and reposted. If you have information about underlined times, please e-mail to j.jenkins@adastrarunning.com. Thanks for running and thank you for your patience in receiving official results. The Ad Astra Running Mass Street Mile is an approximately 1 mile race that utilizes the same course as the Downtown Criterium. "The Crit" course is a figure 8 laid out over Massachusetts, Vermont, New Hampshire, 7th, 8th and 10th streets. Hundreds of spectators line the course to cheer on our runners and the cyclists later. • Free Kids Run (5th grade and younger.) Kids must officially register even though it's free. Choose the t-shirt option to purchase the $12 youth shirt with the free registration. 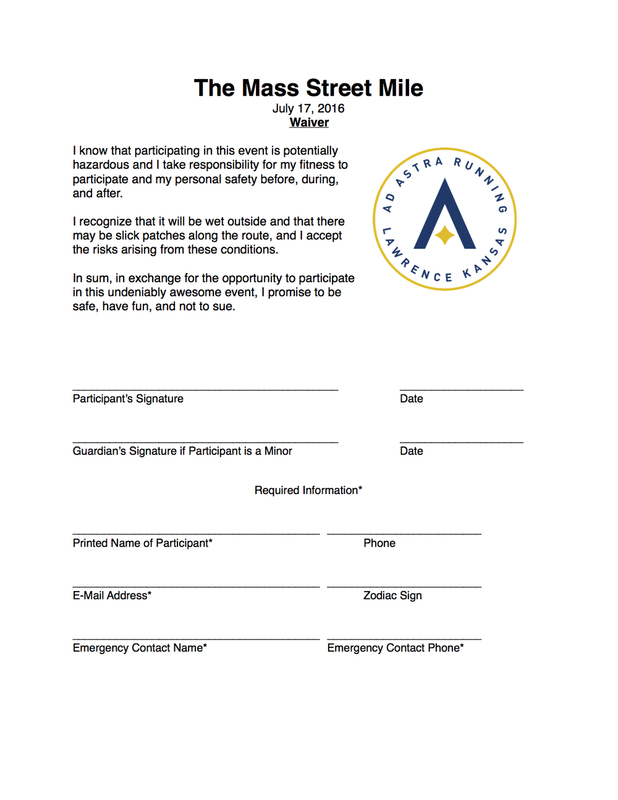 Download and print out the waiver and bring it with you to the race to save your time. Purchase one entry at a time. NOTE: Kids running the free fun run with no shirt, must still be registered by a legal guardian by clicking the Purchase button and filling out the forms and agreeing to the terms and conditions. Fill out all information but leave credit card fields blank (this entry is FREE.) Then Click "Submit Order"